This is a house of horror. A house of metal and country music. That Coldplay stuff isn’t even funny. It just makes for a bad atmosphere. Not too long ago I came home from holiday to find two boxes waiting for me from Arcadia Books. One of those contained See You Tomorrow by Norwegian author Tore Renberg. The other contained Fan by Danny Rhodes (which I’ve just finished). I was caught up in finishing two other books (The Goldfinch and Overlord) prior to picking up See You Tomorrow. I wanted to give it a clear run, the attention a glance at its first pages showed it clearly deserved. I knew nothing of Mr Renberg – first published in ’95 and widely known in Norway for his Mannen som elsket Yngve (The Man Who Loved Yngve) series (upwards of 400,000 copies sold). This is the first novel from a Norwegian author I’ve read and I was pleasantly surprised to find that it’s set in Stavanger – a city I’ve been lucky enough to visit. That being said, the Stavanger within these pages is so far from the tourist’s snapshot I got of the city on my visit that were it not for the mention of a few landmarks and one character visiting Platekompaniet (a music store I shopped in during my own visit), I’d not be able to bring the two versions together in my mind. There’s a great few articles to read around this, on the use of music within the novel (link) and a great interview (link). Even now, two books on, I still feel under the spell of those red-edged pages. To review it was hard. I needed to review it, I wanted to review it but how to find the words when I hadn’t come across something this (and I don’t often use this word) groundbreaking for a long time. How was the question I was faced with, how…. How do you review a book like See You Tomorrow; a book that deftly defies classification by mere genre yet incorporates elements from each, creating a compelling tapestry of a novel that satisfies every criteria for great fiction? I suppose that’s a start. At least it’s a start that doesn’t – deservedly – lay every superlative possible on it. See You Tomorrow captures the events of three days in which Stavanger is treated to unexpected, unseasonable warmth and sun as the lives of eleven characters cross paths with violent results. 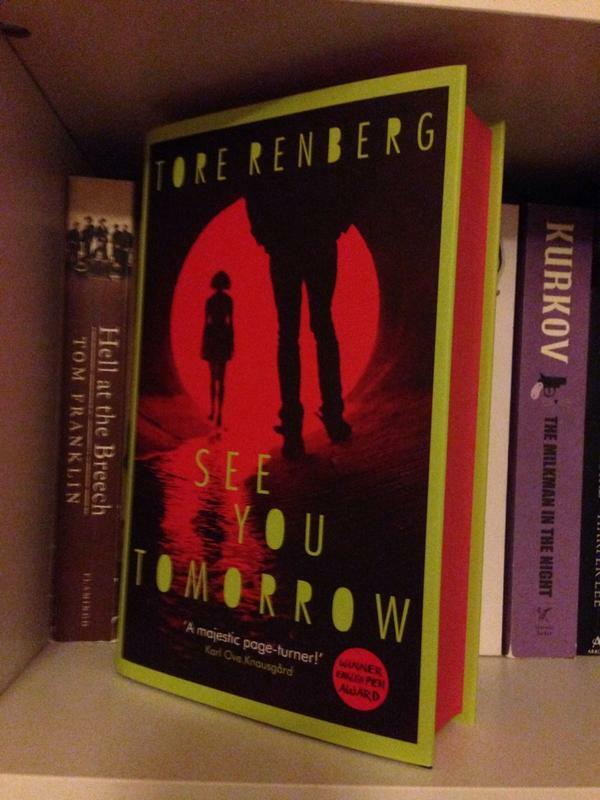 Tore Renberg has said that it took six years to write See You Tomorrow. That he created playlists for each of the principle characters from whose perspectives the story is told (all eleven of them) in order to get into their skin. It shows. Each of the characters live and breath in these 600 pages with such an alarming vitality – very alarming in the case of Tong – that I hated putting this book down for fear something would happen while I wasn’t immersed in its world. It’s just that gripping. Yes, there are 600 pages but there’s not a spare word amongst them. The narratives are so densely written and the events of the story’s three days so closely examined from every angle that the story rips along at a breakneck pace. Themes abound – from broken families, social criticism, criminal undercurrents and the destructive power of secrecy to the frustrating catchiness of Coldplay – all served with dark humour and a quest to find the light in such a world. And there’s the key. For all the damage the characters in See You Tomorrow carry with them and into the lives of others, this novel is ultimately uplifting. Whether it’s Pål’s desperate measures to end his financial burdens, Daniel’s ‘life-plan’ to mute the horror of his past to Tiril’s singing Evanescence to a crowd… even the delightfully unhinged petty criminal Rudi is a self-declared man of love. All are looking for the ray of light in these dark times, a way out, a release from their secret. In most cases, though at no small cost and in ways previously undreamed of, they find just that by the end of the three days. Three days of unexpected warmth and light when least expected. I cannot imagine just how tricky this book must have been to translate yet Sean Kinsella deserves praise for managing to do just that while retaining Renberg’s mastery of prose and wit. See You Tomorrow is not only one of the best books I’ve read this year but is in serious contention for one of the best I’ve ever read. It would be a struggle to find such an original and compelling book as this. That Tore Renberg has a sequel to unleash upon us can only be good news.